ENMET has a complete array of gas detection monitoring systems and analyzers to help you meet safety monitoring requirements mandated by OSHA, NFPA, EPA and other such agencies. ENMET’s selection of portable and fixed GC gas chromatograph analyzers, are designed to provide toxic chemical analysis for OSHA and EPA compliance monitoring. ENMET’s continuous compressed air monitoring systems for carbon monoxide are designed to meet OSHA 1910.134 monitoring requirements for Grade D breathing air. Our more advanced compressed airline monitors also meet NFPA 99 “Medical Air System Guidelines” for CO and dew point monitoring and are UL and CSA certified for Medical Electrical Equipment Safety Requirements. Our rugged EX-Series sensor transmitters are designed for harsh environments with a NEMA 4X, NEMA 7 and IP66 rated explosion proof enclosures, and are approved for Class I, Division 1, Groups B, C & D.
CO-GUARD is a compact, easy to install and operate compressed airline carbon monoxide monitor that meets OSHA monitoring requirements for Grade D breathing air. AFS-100 is a compact compressed breathing air filtration system that removes oil, water, solid particles and odors from a compressed air system. MedAir 2200 is a compact, easy to install and operate compressed airline monitor that can continuously and simultaneously monitor up to four gases in real-time using internally mounted sensors. eGC (environmental Gas Chromatograph) represents a new cost effective approach to gas chromatographic monitoring products for field applications. 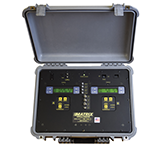 The MATRIX medical gas verifier is designed forthe real-time analysis and verification of hospitalgases to ensure compliance with NFPA 99.